George Herbert Walker Bush, whose careful custodianship of the unraveling of the old Soviet Union shaped a safer world for hundreds of millions, was mourned by a grateful nation Wednesday in a state funeral that brought together Republicans and Democrats in an increasingly rare demonstration of civility. 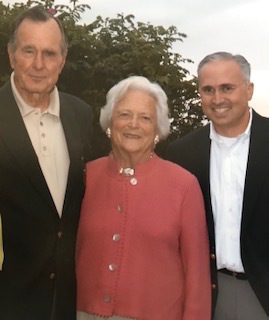 Historians will measure the late president’s life by familiar quantities, like the challenges he managed and the policies he championed, but the best measure of Bush’s life and legacy isn’t the number of bills he signed or the votes he won but instead the lives he shaped--lives, like mine, that were irrevocably impacted for the better. In fact, I don’t know who or where I’d be today but for President Bush. It was in the fall of 1987 that I first met the then-vice president, on whose early campaign for the White House I was working to organize college students and later his bid to win Georgia. After a decisive electoral vote victory, I followed President Bush to Washington to serve in his administration. By happy coincidence, my postings in his administration aligned with some of the president’s greatest and most consequential actions. First, at Health and Human Services, we helped implement his precedent-setting child-care package and the Americans with Disabilities Act, one of his most enduring pieces of legislation, and later, at the Peace Corps with Senator Paul Coverdell, we were on the frontlines of humanitarian and development work in Eastern Europe when the Iron Curtain collapsed. It was during those years that I learned from the example of the most powerful man in the world the importance of humility, goodness and civility. Indeed, in his final days as president, he wrote an exemplary letter to Bill Clinton, to whom he had just lost reelection in a bitter campaign. It’s hard in today’s hyperpolarized political environment to imagine a bested incumbent being so gracious to the man who defeated him, but that was the George Bush I knew: unfailingly kind and thoughtful. I still remember seeing him in Kennebunkport on the day he had just shaved his head as a sweet sign of solidarity with the young son of a member of his Secret Service detail who had just been diagnosed with cancer. Today, America is without the gentle and wise counsel of its 41st president, but the points of light he ignited in millions of Americans like me will live on in his memory. Eric Tanenblatt served in President George H.W. Bush’s Administration from 1989 to 1991. He chairs the global public policy and regulation practice at the law firm Dentons.